The Orobora logo is derived from a work by collage artist Deborah O’Keeffe, spouse of Orobora Content Director, Steve O’Keefe, but spelled with one more “f.” It’s a long story. Deborah O’Keeffe has embraced a new art form, which she calls “mosaic collage.” She uses small bits of colored paper to build up abstract collages. What makes them “mosaic” is that she often mortices these tiny pieces of colored paper next to each other, leaving the line between showing through. The effect is similar to the look of mosaic tile, but Deborah is able to work with pieces significantly smaller, with richer colors and lower material costs. 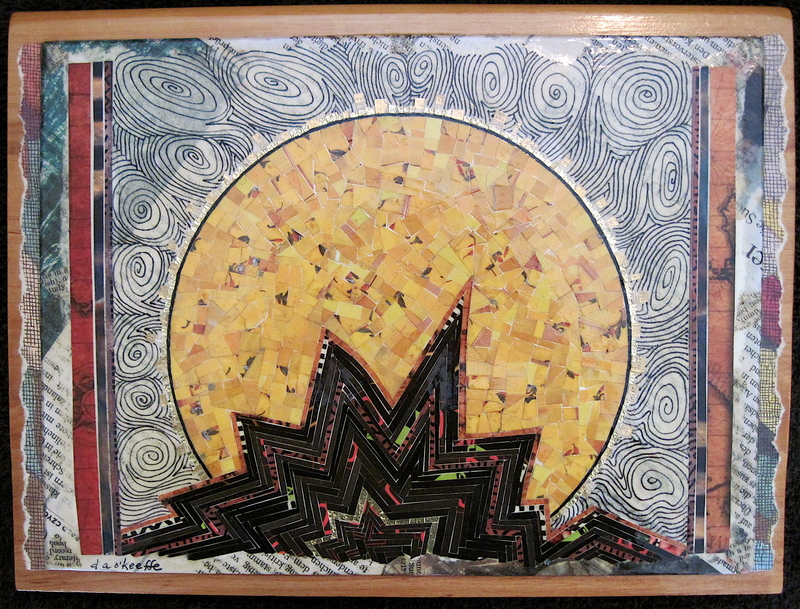 Night River Moon (detail) by Collage artist Deborah O’Keeffe. Photo by Deborah O’Keeffe – All Rights Reserved. Many of her pieces use salvaged materials as substrate, which she first cleans, then wraps in paper to get a good surface for collaging. 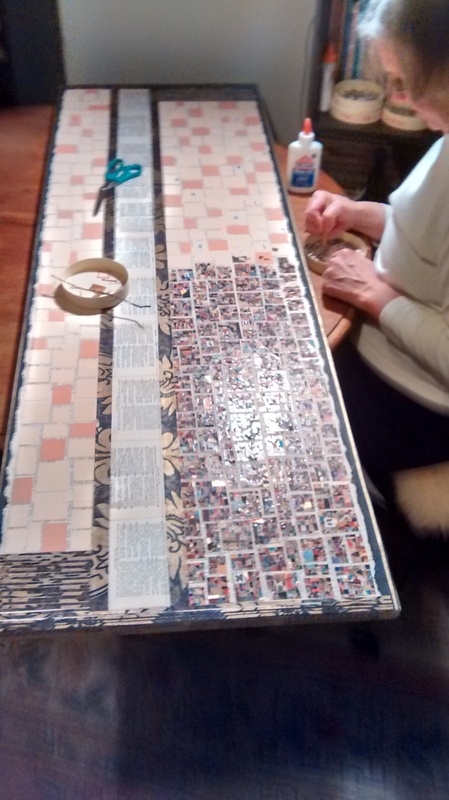 The images below show Deborah working on one of her largest pieces, “Lamentations,” which is collaged over the top of a wooden coffee table that was tossed to the curb after Hurricane Katrina. Between the two halves of the piece, she will apply the written rants of a homeless person who vents his thoughts in blue ink on long sheets of paper towels. Collage artist Deborah O’Keeffe working on “Lamentations.” February 2015. Photo by Steve O’Keefe — copyright free. 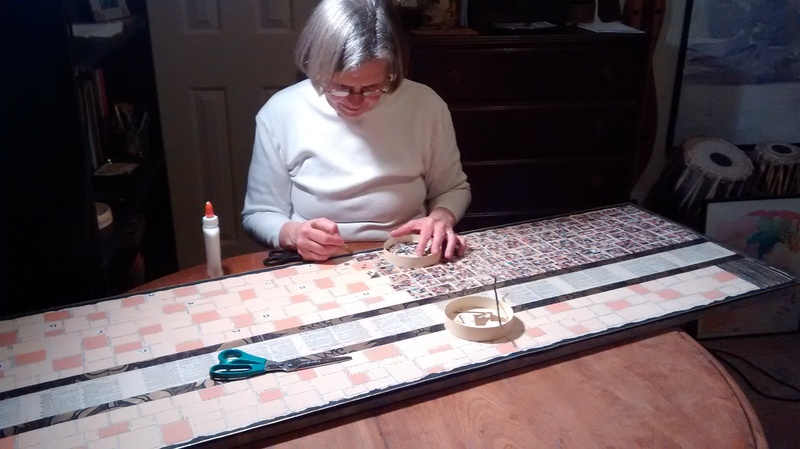 Collage artist Deborah O’Keeffe shown at work on her piece, “Lamentations.” February 2015. Photo by Steve O’Keefe — copyright free, use as you please. Deborah O’Keeffe’s pieces are often inspired by her favorite artists. In 2014, a show on aboriginal art led to many large collages. Many of her friends are artists whose works have inspired her. Here is a recent piece, Saint Michel, inspired by the image, next to it, of a mosaic by French muralist Charles Lameire, from an exhibit at the Musée d’Orsay in 2015. Saint Michel by collage artist Deborah O’Keeffe. All Rights Reserved. 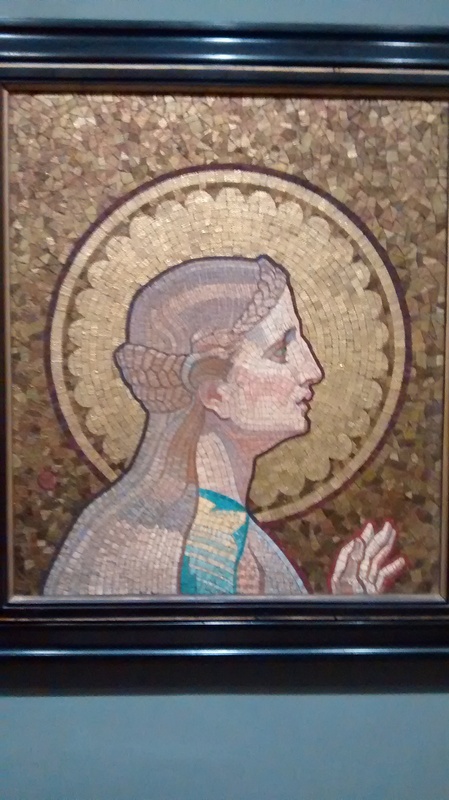 Mosaic by Charles Lameire. Photo by Steve O’Keefe, copyright free. April, 2018: Royal Oak, Michigan, Spring Art Fair, sponsored by The Guild. Civic Center, 316 E. 11 Mile Road (corner of 11 Mile Road and Troy Street) downtown Royal Oak, Michigan. Free parking, free admission. Magic City Art Connection 35th Contemporary Art Festival, Friday, April 27 through Sunday, April 29, Linn Park (across from the Birmingham Museum of Art), downtown Birmingham, Alabama. For more information visit http://www.MagicCityArt.com. Stockley Gardens Spring Arts Festival, May 19, 20 (Saturday 10-5; Sunday noon-5), Stockley Gardens Park in the heart of the historic Ghent district of Norfolk, Virginia. For more information visit http://www.hope-house.org. Sidewalk Art Show, June 2, 3 (Saturday 10-5; Sunday 10-5), around the Taubman Museum of Art, downtown Roanoke, Virginia. For more information visit http://www.taubmanmuseum.org. American Artisan Festival, June 15-17, downtown Nashville, Tennessee, in Centennial Park, near the Parthenon. For more information visit http://www.americanartisanfestival.com. Crooked Tree Outdoor Art Fair, Saturday, July 28, on the grounds of Northwestern Michigan College, Traverse City, Michigan. For more information visit http://www.crookedtree.org. Mount Gretna Outdoor Art Show, Mount Gretna, Pennsylvania, August 18, 19. Royal Oak Market: Fall Art Fair, sponsored by The Guild. Thursday, November 15, Friday, November 16, 12:00 noon – 10:00 p.m. Civic Center, 316 E. 11 Mile Road (corner of 11 Mile Road and Troy Street) downtown Royal Oak, Michigan. Free parking, free admission.